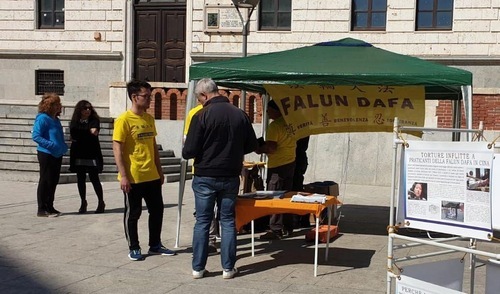 Falun Dafa practitioners from the island of Sardinia gathered in Cagliari on March 24, 2019 to raise awareness of the persecution of Dafa in China. They also wanted to meet with those who expressed interest in learning the exercises during activities held in January. This time, even more people stopped to ask for information. Practitioners demonstrated the exercises and chatted with passersby. Many people were attracted by the calm exercise music and stopped to read the display boards. Practitioners gave out origami lotus flowers. Those who were keen to learn more about the practice received the Italian version of two Falun Dafa books, Falun Gong and Zhuan Falun. One woman was keen to hear more about Falun Dafa. When she learned that practitioners in China were persecuted for their faith, she immediately signed the petition calling for an end to the persecution. She told her sister about what she had heard and asked her to sign the petition too. A passerby asks practitioners questions about Falun Dafa. A couple from Brescia had recently returned from a trip to China. 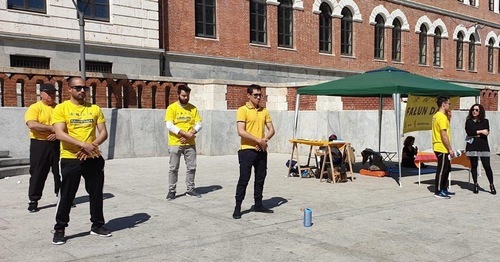 They were thrilled to meet Falun Dafa practitioners from Sardinia and listened carefully as practitioners explained about the persecution in China. A couple with a nine-year-old son lived in China for a long time. They told practitioners that they had heard about the suppression. However, they were shocked to learn about the harvesting of organs from Falun Dafa practitioners imprisoned in China. Three tourists from Germany asked for information about Falun Dafa. One of them, a young woman, told practitioners that her father practices Dafa and that she was thinking of taking up the practice. She warmly embraced a practitioner and joined her friends in signing the petition. Paola is a teacher. Most of her students are ethnic Chinese. She expressed interest in the spiritual aspect of Falun Dafa and wanted to read Zhuan Falun, the main book of the practice. She said she would consider introducing Falun Dafa to her students.